Tourism supports the wine industry in Virginia. Pandit and Sudha Patil own Narmada Winery in Amissville. It opened in two thousand nine. The Indian-American couple says many of their customers visit local wineries instead of taking a vacation. Pandit Patil hopes that idea keeps spreading. Like many wineries in Virginia, Narmada is in a beautiful country setting. And they have live music on the weekend. Narmada visitor Ted Sevigny says the winery also offers something that others do not. DOUG JOHNSON: Our listener question this week comes from Andre Weigel in Brazil. He wants to know about the culture of the people in America’s largest city. New York City, in the state of New York, is the largest city in the United States. More than eight million people live there. That is more than two times the number of people in Los Angeles, California, America’s second largest city. New York City is the cultural capital of America. It is an important center for art, architecture, theater, music, dance and film. New York is also known for its cultural diversity. About thirty-six percent of the people were born in a foreign country. If you asked those people where they are from, they would probably say: The Dominican Republic, China, Jamaica, Guyana, Mexico, Ecuador, Haiti, Trinidad and Tobago, Colombia or Russia. Most new immigrants come from those ten countries. However, about one hundred seventy languages are spoken in America’s largest city. Many Europeans moved to New York about one hundred years ago. They came mostly from Italy, Ireland, Germany, Russia and Poland. Today, the New York City area has the largest number of Jews outside of Israel. It is also home to more African-Americans than any other American city. Except for Puerto Rico itself, more Puerto Ricans live in New York City than in any other place in the world. Immigrants often live in communities with other people from their countries. These include communities of Italians, Russians, Chinese, Koreans, Dominicans and Puerto Ricans. 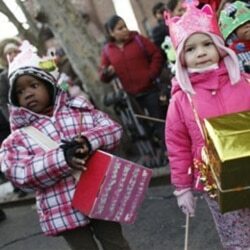 About forty-four percent of all New Yorkers are white. A little over one-fourth are African-American. About one-fourth are Hispanic or Latino. Nearly twelve percent have Asian ancestors. One thing that all New Yorkers have in common is the density of their city. Millions of people live in a small place. New York City has five boroughs. They are the Bronx, Brooklyn, Staten Island, Queens, and Manhattan. The island of Manhattan has almost twenty-six thousand people per square kilometer of land. The streets of Manhattan are very crowded because so many people live and work in there. Most people travel in buses, taxi cabs, or underground in the subway instead of owning cars. Most live in tall apartment buildings. Manhattan is home to some of the wealthiest as well as the poorest people in the city. DOUG JOHNSON: The California-based band Cake released “Showroom of Compassion” last week. It is the band’s first album in seven years. Many fans were expecting greatness. Some are satisfied, others are not. Mario Ritter has more on Cake and plays songs from the new album. MARIO RITTER: Cake has been together since the early nineteen nineties. The band has released six studio albums including “Showroom of Compassion.” However, band leader John McCrea told Rolling Stone magazine that he thinks about breaking up with the band every day. He says he likes making music. But he says concerts and selling tee-shirts is the only way to make money in the business. McCrea says that means a lot of airplane travel and pollution. He says he would like a career that is less damaging to the environment. Cake’s website contains environmental messages and news. The band also completed building a solar-powered recording studio in two thousand eight. The new album was made there. 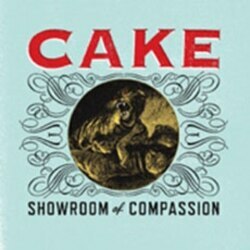 Some critics note that “Showroom of Compassion” sounds a lot like past Cake albums. John McCrea does not have a problem with that. He says he likes Cake’s sound. But he says this album does include slow songs and more piano than usual. “Got to Move” sounds like traditional Cake. Cake is currently appearing around the United States and Canada. As usual, the band will be giving away one tree to one lucky concertgoer at most shows. Cake hopes this will help influence other fans to plant trees to help the planet. DOUG JOHNSON: I’m Doug Johnson. Our program was written by Jim Tedder, Susan Logue and Caty Weaver who also was our producer.